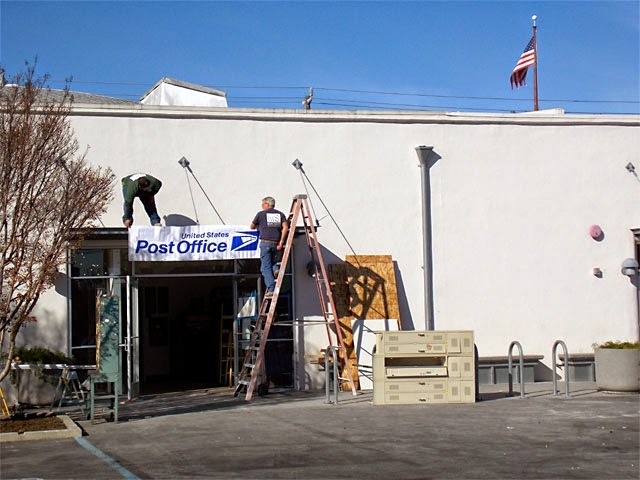 It's interesting to photograph post offices that are under construction, in the process of being opened. 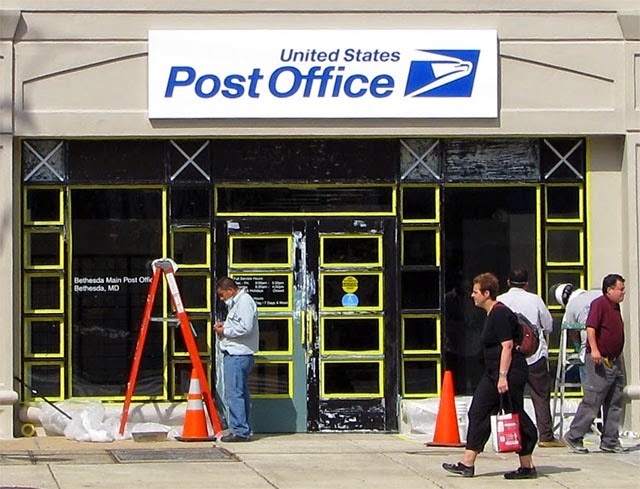 Nearly 100% of the time a new postal facility will be replacing one or even two other offices. I've come across this a handful of times, but never quite in the stage of construction my friend documented a new facility in Santa Cruz, California a few days back. 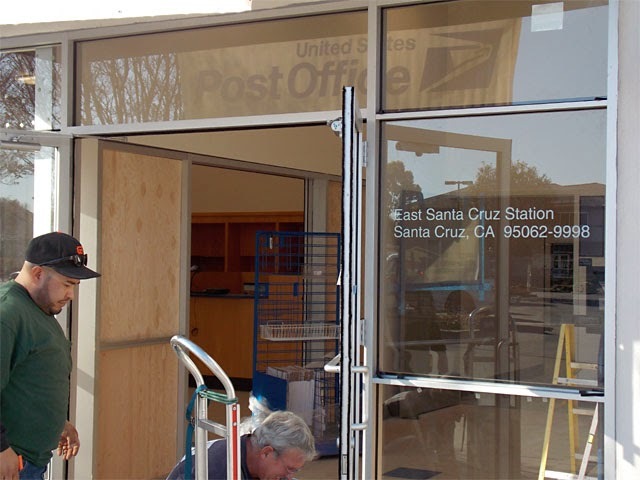 On January 12, the East Santa Cruz Station opened at its new location at 1148 Soquel Avenue after having lost its lease at its former location, 120 Morrissey Boulevard. Reportedly the landlord severed the lease so that a grocery store could move in. Here's USPS's local news release. This photo of the old East Santa Cruz Station was taken by my friend John back in 2001. 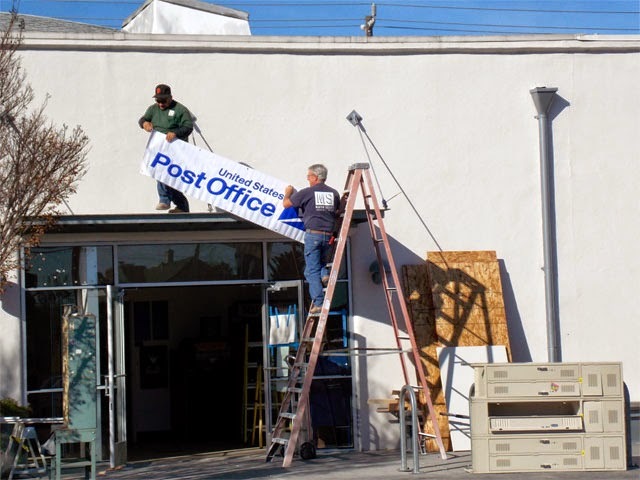 My friend Doug arrived the day before the opening of the new P.O., January 11, just as construction crews were hanging what appears to be a sonic eagle post office sign above the entrance to the new facility. He even witnessed them stenciling letters to the glass window and installing other materials. I think it's interesting to see the process in action. Looking closely, you can see the new standard retail design theme for the counter area inside: faux-wood surfaces with rounded blue "marble"-grained countertops. You can find more photos at Doug's photostream here. I witnessed a similar event in Maryland back in 2012, though by that point the new post officewhich was replacing both a historic New Deal facility and a primarily carrier facility nearbyhad already opened. The workers were still putting the finishing touches on the new space. (There's a collection box located at the corneras it should be! just out of frame to the right. 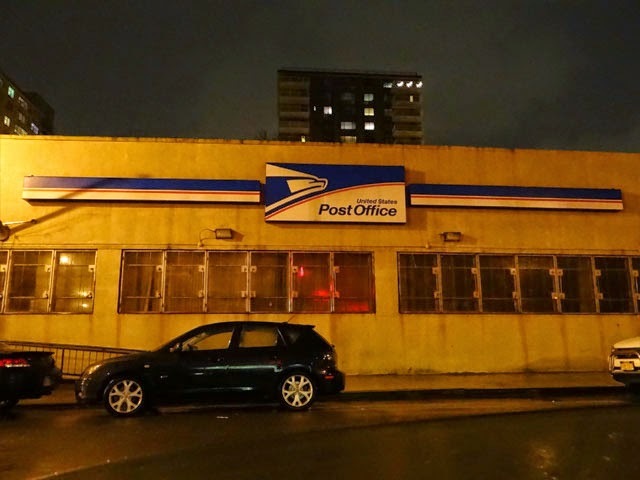 The new post office is expected for retail services next month. 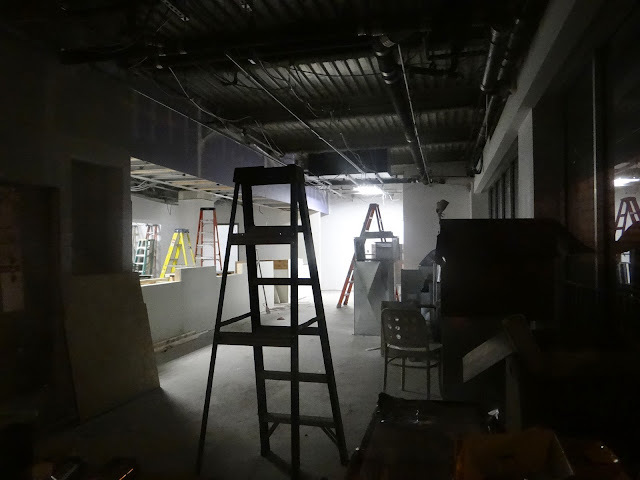 The retail counter area is still under construction. For now, though, the Post Office Box lobby is accessible to box holders. When all is said and done there will two customer entrances to the post office storefront, one to the P.O. Box lobby and one to the retail area. The areas are separated by a lockable door. For now just the outer box lobby door is unlocked, and only during designated hours. 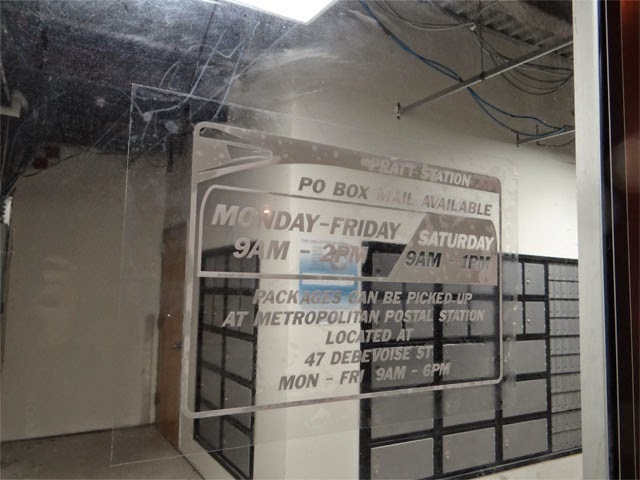 Did you notice what the sign says about package pickup? This is apparently a lost customer convenience. The retail area promises to resemble East Santa Cruz Station'sheck, all recent and currentareas in its design theme. However, Pratt's will likely feature transparent bulletproof barriers between the clerks and customers. 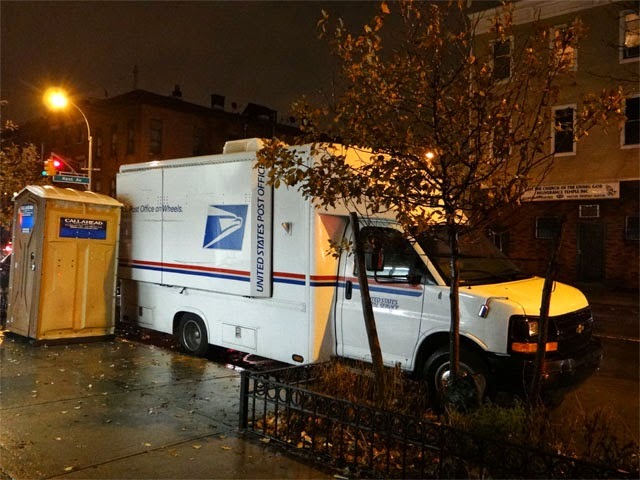 That's just how it is at about 90% of post offices in New York City. 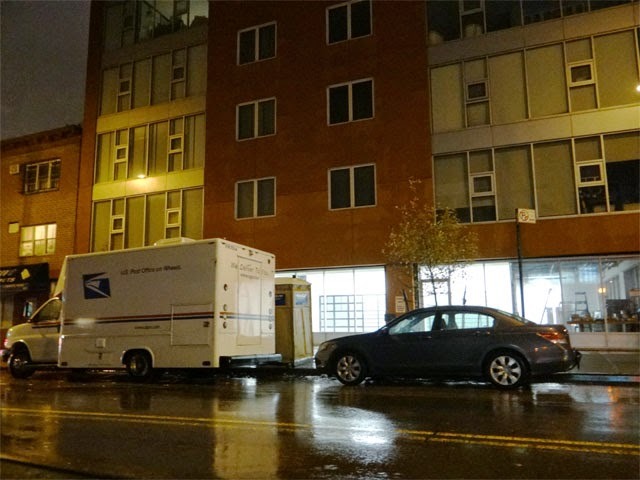 A USPS Mobile Unit-never would have thought of that, but it makes sense-so cool to see!